Developed from the TLB-20, which is also produced by this company, the TLD-20 is currently the best honing machine available. 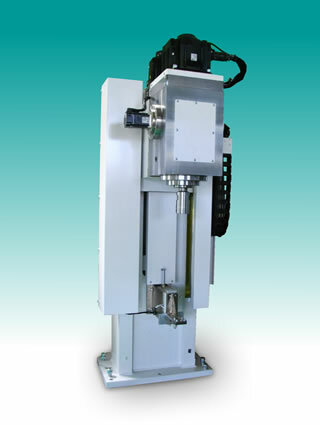 A unique mechanism with variable feeding speeds, a column with high stiffness and accuracy, and the newly designed spindle head complete a single-pass honing process with ultra-high accuracy for various customers. As a result, the finishing process is completed within a few seconds, ensuring the customer’s production line highly efficient and profitable. The spindle head is the most important part of the honing machine. TAKEZAWA-SEIKI developed the new spindle head when they were developing the TLD-20. Until TLD-20 was developed, the same motor has been used for the spindle and oscillation(*1), now, the motors are separated, enabling the spindle motions and the oscillation motions to be controlled independently. This makes it possible to achieve optimum machining settings, such as work material and prescribed precision, thereby meeting and exceeding previous requirements. (*1) The oscillating structure is explained here. Furthermore, the newly adapted column with high stiffness and accuracy is able to absorb the force generated by the high-power motor that has a maximum output power of 7.5 kW(*2). This means that the TLD-20 honing process of large holes is highly accurate and exhibits high accuracy and efficiency to meet a wide range of customer needs. Using our technology, one does not need to be concerned about a trade-off between machining accuracy and time. (*2) It is possible to modify the mounted motor to meet customer's requirements. Ultra-high accuracy at a maximum honing diameter φ60, grinding allowance φ90μm, cylindricity of 5μm, and surface roughness (Ra) of 0.8μm are realized. When the TLD-20 is equipped with a 7.5 kW high-output motor, even the honing process for large holes can be carried out with high accuracy. When the honing diameter is φ60 and the grinding allowance is 90μm, a cylindricity of 5μm and a surface roughness (Ra) of 0.8μm(*3) are realized in a single pass. (*3)This case is FCD250 steel. Your company’s production efficiency will increase drastically with full automation. Full automation is possible by equipping the TLD-20 with supply, conveyance, and delivery mechanisms as well as with an automatic measuring device that uses an air micrometer. With the TLD-20 as a base, it is possible to create a high-speed fully automatic device in a short time. By introducing the TLD-20 to a fully automated line, the production efficiency of the finishing process, which can easily become a bottle neck, is drastically improved. Other feature Universal joints can be used. Floating　holders can be used.